IHG Rewards Club has relaunched the membership weekend stay offer for stays in China + Holiday Inn Macao Cotai Central. Base members get 20% off, Gold ones 30%, Platinum and Spire members 40% off of the Best Flexibe Rate for the dates in question. The main benefits beyond the discount are the breakfast for four and guaranteed 4PM check out. Business hotels tend to have plenty of availability during the weekends and it makes sense to discount the inventory. The 40% off discount combined with breakfast for Platinum & Spire members is a good one as long as the Best Flexible Rate is reasonable. Member participation implies that members have carefully read and agreed to the terms and conditions of this promotion. From 28 March to 28 December 2016, IHG offers an exclusive rate to IHG® Rewards Club members of Spire Elite and Ambassador member status. 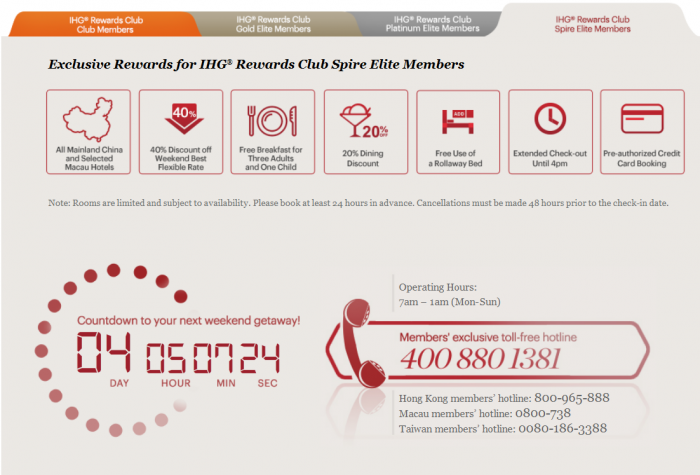 This offer applies to all IHG® Rewards Club elite members with Spire Elite or Ambassador member status who are long-term residents of cities across Greater China. “Long-term residents” are Chinese citizens or foreign nationals who have lived in Greater China for an extended period of time, and in any case of dispute, IHG’s judgment will be final. Concerning the 40% accommodation discount: By making reservations at participating hotels, members can enjoy a 40% discount off Best Flexible Rate for weekend stays (Friday, Saturday, and Sunday nights-not applicable to public holidays in cities across Greater China). Please note that the Best Flexible Rate of Holiday Inn Express® hotels include free breakfast, but the Best Flexible Rate of other hotel brands does not. Concerning the free breakfast: Guests can claim a free breakfast for up to 3 persons and one child per room (excluding service charges. Also this benefit cannot be used concurrently with other promotional vouchers or benefits). Concerning the extended check-out and free rollaway bed: With this promotion guests can enjoy late check-out until 4:00pm (standard Beijing time) and a free rollaway bed. Late check-out and rollaway bed must be requested at time of booking and is subjected to availability at the hotel. Cancelling or changing your reservation must be done 48hours before 6PM (local hotel time) prior to arrival date will result in no charge. Cancelling or changing your reservation after 48 hours 6PM (local hotel time) prior to arrival date, or failing to show, will result in a charge of 1 night per room to your credit card. Taxes may apply. Failing to call or show before check-out time after the first night of a reservation will result in cancellation of the remainder of your reservation. Rates and availability are subject to any potential future changes by IHG. The number of rooms available for this promotion at participating hotels is limited. Room availability is subject to hotel conditions, and during peak seasons rooms may not be available. Complimentary Platinum and Spire Elite member upgrade is subject to room availability and for one room only. Upgrade is confirmed to next available room type. Only up to 2 rooms can be reserved per member per reservation. Elite members will only be able to make reservations for stay up to 2 months ahead for this rate. Booking must be made 24 hours in advance and credit card guarantee is required. In addition to agreeing to the terms and conditions of this promotion, the participating members of IHG® Rewards Club must also comply with IHG® Rewards Club Membership Terms and Conditions . The “Elite Member Exclusive Reward” weekend night cannot be exchanged or resold for cash and is not transferrable in the system to other Members and guests. We will reserve the right to remove a member’s promotion related reservations or privileges if fraudulent use of this offer is detected. IHG® reserves the right to terminate promotion at any time, without prior notice, without compensation. These terms and conditions are written in both English and Chinese, with both versions having equal legal effect. If there are any discrepancies between the two versions, the Chinese version shall prevail in all instances.